This is a roundup of all the breaking news from around the Las Vegas valley for August 21, 2018. Las Vegas Police confirm a homicide on the 800 block of West Lake Mead near H Street. Police say a man was found with multiple gunshots wounds in the parking lot of an apartment complex after they received an anonymous call about hearing gunshots. The victim is describes as a black male in his late 20s. Southbound Interstate 11 has opened after an earlier crash. All southbound lanes are blocked on Interstate 11 at Railroad Pass due to a crash. Thurman White Middle School in Henderson was put on a soft lockdown Tuesday afternoon after a threat was called into the school. The phone number was untraceable. Clark County School District police later determined the threat was "an unfounded hoax" and the school was taken off lockdown. Firefighters are on the scene of a house fire on Brooks Avenue near Torrey Pines Drive and Cheyenne Avenue. According to initial reports, the roof has collapsed and the house is fully involved. The fire was supposedly burning for more than an hour before firefighters arrived. The house is a rental and the occupant has not been located at this time. Police are investigating a death near Sunrise Avenue and 21st Street. An individual was found inside of a vehicle with a head injury. 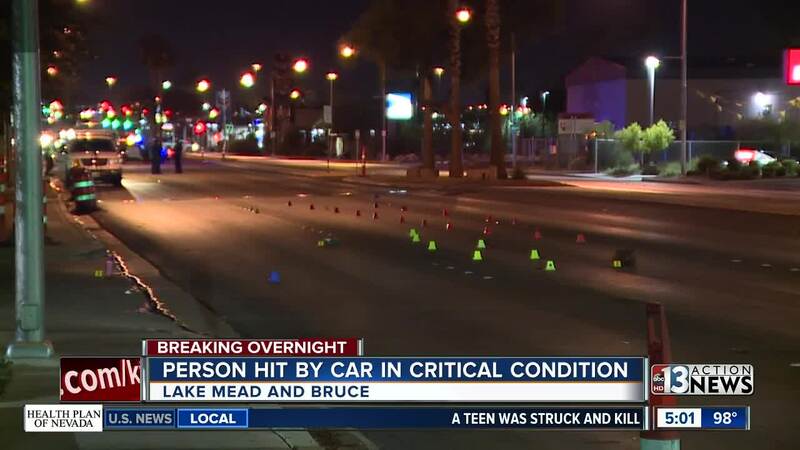 A woman in her 50s was hit while crossing the street near Lake Mead and Bruce overnight. She was critically injured. Police say she was not in a crosswalk.